Do you often bully your class mates or your playmates just to cool things down? Or you often see your friends do it to others? You had better to think it twice if you want to bully someone and warn those who bully others. We don’t know for sure whether our friends who have been bullied can take it as a joke and take it lightly or if they feel hurt because of the bullying. The most worrying thing is that bullying can make the victims become more depressed and take threatening actions, including suicide. 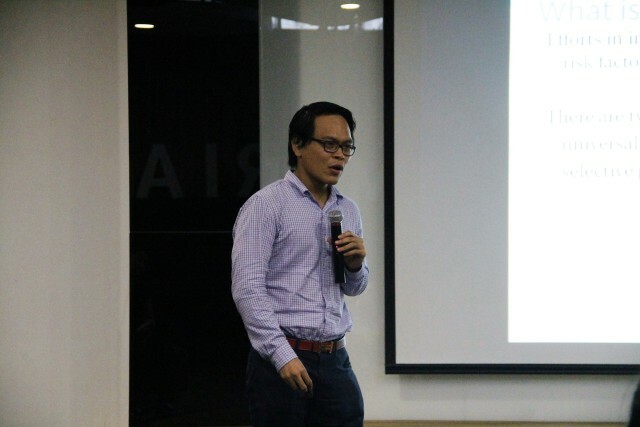 This is revealed by Benny Prawira, Youth Mental Health and Suicidae Prevention activist during the Tech Media Talk held by students of Communication Program Binus University International at Binus FX Campus on Tuesday (29/3). Benny explains that there are 6000 recorded suicide cases in 2012. However, he thinks that it is an iceberg phenomenon as he believes there are still many unrecorded suicide cases, suicide attempts and people who think of commiting suicide. Benny Prawira, Youth Mental Health and Suicide Prevention Activist, explains that there are 6000 recorded suicide cases in 2012, at Tech Media Talk (3/29). However, he thinks that it is an iceberg phenomenon as he believes there are still many unrecorded suicide cases, suicide attempts and people who think of commiting suicide. In the postmodern society, we can find conflict between old and new values and individualism with various problems on micro or macro level. All of this can make individuals become confused and pressurized in living their life. For those who are resilient and ignorant, they can face their life problems with ease. However, there are people who are emotionally fragile from time to time. These people are so pessimist within their life and can be easily “tempted” with the idea to commit suicide. “People can look so normal on the outside, or even joyful. But on the inside they are very weak. Therefore, you have to think it over and over again before you make fun of your friends. We do not know for sure if your friends have serious issues, depression, and your bullying will be their trigger to commit suicide,” said Benny who is also the founder of Komunitas Into the Light Indonesia, a community which mainly deals with the prevention of youth suicide. As a matter of fact, Benny suggests us to smile to everybody who passes by or look at us. “Do not worry if people do not smile back or even consider us as weirdo. By smiling we can at least help those who have psychological problems because they won’t feel alone or being ignored,” said Benny. Benny said that it is still rare to find experts in Indonesia who care about the prevention of teen suicide issue. For that reason, in May 2013 Benny established Komunitas Into the Light Indonesia as a community focuses on raising the awareness of Indonesia’s young generation regarding the importance of mental health and suicidal prevention. Benny explains that suicidal prevention is an effort to raise protective factor and minimizing suicidal factor, which has two types of prevention which are universal prevention for general population and selective prevention for certain population. Benny advices those who feel alone with serious life issues to join with his community so they can share their problems and stay tough to live their life. “I know you’re sad. Then I won’t say have a good day to you. I just want to say keep living. Stay alive. Eat well, dressed well and don’t give up on yourself. Everything is going to get better,” Benny concludes.